As we can see, the playback of AVI file on iPhone 5S depending on whether your AVI files wraps an MJPEG video bitstream can be an intolerable thing. How about a limitless AVI playback on iPhone? Actually, there is an ultimate solutionunrestrictedly as long as you have a iPhone 8/8 Plus video converting software like MacX Video Converter Pro. It is a smart AVI to iPhone converter software for Mac (El Capitan) and PC (Windows 10) users to convert any video like FLV, MTS, M2TS, AVCHD, MKV and AVI to iPhone 8/8 Plus, iPhone 7s/7/6s/6/SE/5s, Samsung Galaxy S8/Note 8 and more in a few clicks. And this AVI video converter delivers excellent output quality with the fastest conversion speed, due to the advanced use of Intel's QSV hardware acceleration tech! Play AVI Videos on iPhone 8/Plus Smoothly! Best AVI to iPhone 8/8 Plus converter can easily convert MKV, MTS, FLV, AVI etc to iPhone 8/8 Plus/7s/7/6s/6/SE more with world's fastest speed (5X faster than any other converters). Step 1: Add AVI Video File. Download iPhone 8/8 Plus video converter on Mac, or get the Windows version for PC users. Click "Add File" to import AVI file on your Mac computer. You can also add more than one AVI or other video files and convert them at one time. Choose the output format as you like. Simply hit Apple Device -> to iPhone Video -> iPhone 8/8 Plus, iPhone 7s/7s Plus (MPEG4) or (H264) as the output format etc. 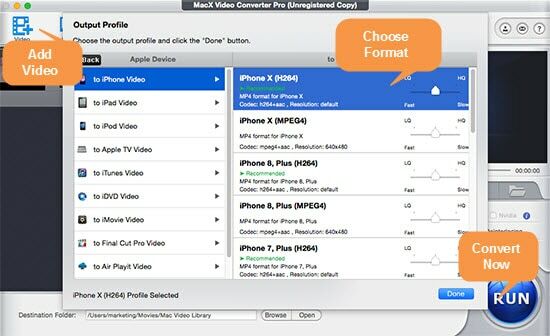 Or you can go Mac General Video and select iPhone 8/8 Plus viewable format like MP4, MOV or M4V as the output format. Hit the "RUN" button to start getting AVI converted to iPhone 8/8 Plus on Mac. After finishing the video conversion, you can import it and play AVI on iPhone 8/8 Plus anywhere anytime. This article will share you a simple way to download video from YouTube on iPhone 8/8 Plus with the help of MacX Video Converter Pro. Just a few clicks, you can play your beloved YouTube FLV AVI videos on iPhone 8/8 Plus at any time. Best iPhone 8 video converter to easily convert videos to iPhone 8 (iPhone 7s/7/6s/6 incl.) in 1080P, 4K 2160P, 8K 4320P MKV, MTS, AVI etc with top quality and 83 x faster speed. Also iPhone 8 video download in HD MP4 from 300+ sites is allowed.